Some years ago I was chatting to an American gardener on a forum about my cat problem and he told me about a popular product they had over on that side of the pond known as The Scarecrow that sprayed a jet of water at animals whenever it detected movement within its range. It sounded like a great tool but being for the American market I imagined it would cover acres of land rather than your typical English garden so I never went as far as trying to find a UK supplier. I then found the PestBye jet sprayer which was made for the UK. it covered up to 100 square metres and you could adjust the range. Mine arrived and I quickly got it set up easily enough. 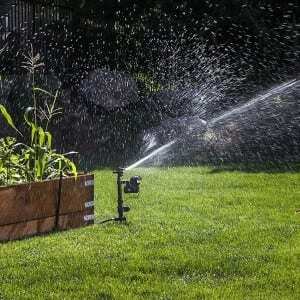 It comes with a spike so you can put it into the ground and then you simply attach your hose pipe and turn on the water. The motion detector runs on 4 AA batteries and when it detects movement the sprayer is activated and a jet of water arcs out in front of it covering an adjustable angle. The water lasts about 5 seconds and then it resets itself waiting for the next movement. If it sounds too good to be true thats because it is. It certainly works and cats would definitely keep well out of its way. The trouble was that plants moving in the breeze set it off, neighbours cutting the grass or setting up the BBQ set it off (oh how they laughed – not), the wife set it off putting out the washing, our baby daughter set it off, birds set it off and last but not least, I set it off! I lost count of the number of times I walked down the garden forgetting it was on only to get a cold soaking. The other problem with it was that the jet spray repeller is not well made. The sales pitch says it is robust and designed for outdoor use but the one I had soon split where the hose connected. I had to customise it by doing away with the spike and the section that had the hose connector and attach it at a different point. Then the tube at the bottom split at the first sign of cold weather so I had to scrap that and attach the hose directly to the unit as shown below in the picture. I then made a new leg for it from wood and screwed it to the side of some decking. I guess for £30 I was expecting something a bit better made and it’s a shame it isn’t ‘robust’ like they claim because yes it really does work. Those critters jumped 6 foot in the air and shot for the nearest exist like they had a lead role in a Tom and Jerry cartoon. The sensitivity settings are a bit fiddly but if you persevere you can get it set up pretty accurately. I notice too that they’ve reduced the price and while I thought £30 was over priced, at the sale price it’s a bit of a bargain. 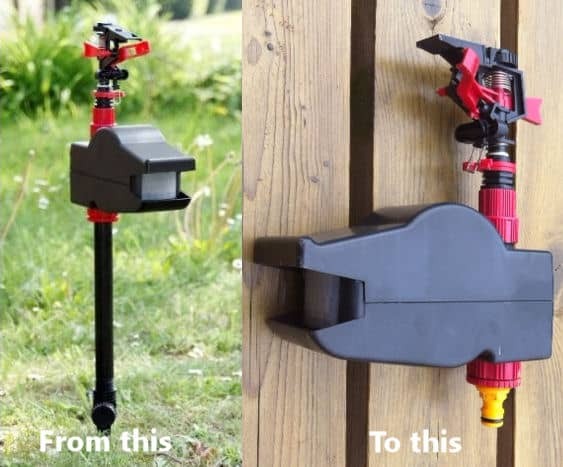 If you do get a Jet Spray Repeller be sure to keep it away from any boundary fences and point it down the garden rather than towards your neighbours garden. Switch off the water and disconnect the hose so it drains empty if frost is forecast otherwise it will split all over the place like mine did. There are currently 31 consumer reviews ranging from ‘hate it’ to ‘love it’ and pretty much everything in between for an average of 3.5 out of 5 and you can read them yourself by clicking here. I’ve moved into a house with a garden a luxury I’ve never had in a city centre flat! I think I could really ‘get into’ gardening. The problem is poo on the lawn. I’ve cleaned it up and wash it down with fairy liquid. It’s not in the same place – it’s randomly all over. I actually like animals and would love a pet but a big reason I don’t want one is the poo. It’s gross. I’ve tried olbas oil on tea bags and have bought lavender and the scary cat plant. Ive tried a dog with glass eyes. I’ve even bought a water gun but I don’t see them. There was an ultra sonic sound devise in the front garden which I put new battery’s and moved to the back but I don’t think it working. I want to try one of these water spray things. I can’t really afford the better quality scare crow. I don’t even have a hose! I’m wondering what I actually need to buy for this to work. On Amazon there is a load of stuff about connectors that I don’t understand – please can you possibly give me some advice? I have just installed mine and it is pretty simple. You connect it up and then connect your hose to the bottom inlet. Most hoses come with standard clip on connectors so it is straight formward. If you are unsure, take it to your nearest B&Q or Garden centre and they will help you. I don’t understand the red clips bit. I can see there are two but how do you set them for the arc size? Where does the little metal bit go? I’ve just set up my cat repeller,and as per instrutions listened for the click of the valve when I waved my hand in front of the sensor.Turned on the tap and it fired the jet over next doors garden.I moved it further back,tried it again,nothing.Took it indoors to check the batteries,connected it up again,it worked,then nothing again.Does it take a while to reset,or is the unit a dud? It certainly works, the red collar is to adjust the arc, it does trigger off sometimes when there is nothing about, the batteries dont seem to last as stated but i only paid £18 for it. The worst bit is that it does not charge the batteries, if it did then i would recommend it.